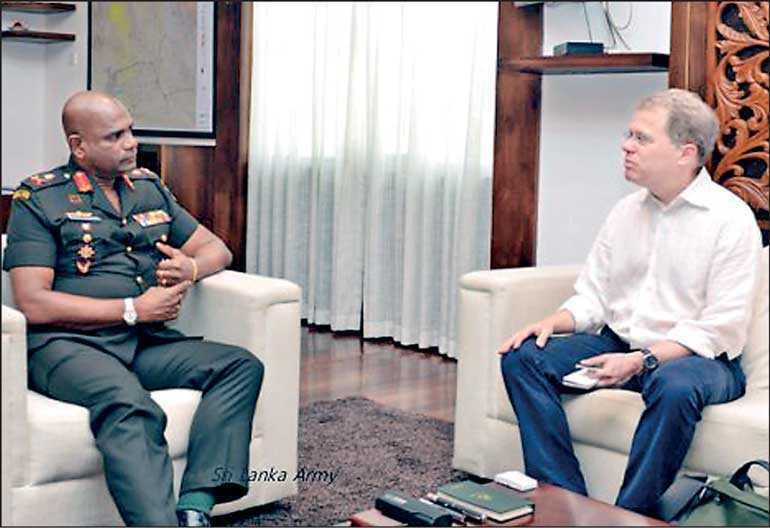 Sri Lanka Army yesterday enlightened the International Crisis Group (ICG) on the reconciliation efforts undertaken by the armed forces in the North when the Project Director and Senior Analyst of the ICG in London Alan Keenan met with the Sri Lanka Army Commander. Keenan, who has paid a courtesy call on the Army Commander Lieutenant General Mahesh Senanayake yesterday morning at the Army Headquarters, has received a comprehensive account on the status quo regarding civil-military cooperation in the North and reconciliation efforts of the Armed Forces in the peninsula, the Army Media Unit said. Lieutenant General Senanayake explained that the Sri Lanka Army is dedicated to the welfare of the deprived civilians and has launched numerous projects to uplift their living standards, education, farming and other socio economic needs by constructing houses, supplying relief items and essentials, agricultural aids, school needs, push bicycles, etc. The Commander recalled also how the Army rehabilitated 13,000 combatants and assimilated them into society to lead lives free from violence. In reply to a query, the Commander of the Army pointed out how a handful of extreme elements could disturb a peaceful society within a few minutes, due to the availability of modern technical and communicative innovations. He also requested Keenan to dispatch a questionnaire if he wishes to have more information and details regarding any of the issues pertaining to the Army involvement in any part of the country. Major General Nishshanka Ranawana, Director (General Staff) and Brigadier Prathap Thilakarathne, Director (Overseas Operations) were also associated with the meeting.